AOSP 8.0 is mainly focused on battery backup and security. AOSP is perfect for daily usage, very smooth and optimized. Also, this custom ROM supports many tweaks. Android 8.0 Oreo can installed via Custom Recovery like TWRP, so you need to install TWRP recovery on Redmi Note 4. If you already installed recovery then let’s begin with the tutorial. Install Pixel 2 AOSP Android 8.1 Oreo ROM for Redmi Note 4 and enjoy the experience of Oreo. Some day ago Google officially launched android 8.0 Oreo. At this time Redmi note 4 doesn’t get Oreo update but many users want to use this new version of Android. For those users today we share Pixel 2 AOSP Android 8.1 Oreo ROM For Redmi Note 4. At a time Xiaomi one of the biggest brand in India and this device has many popular in India. That’s why many developers work on this device. There are plenty of ROMs are available for this devie. But this one is for stock Android lovers. This device released with Android 6.0 Marshmallow with MiUI interface but many users don’t like this type of highly optimized UI. This ROM looks like simple UI (same as stock Android). Also, AOSP gives you an opportunity to OREO experience. It based on Pixel 2 AOSP ROM. Create a full backup of your device. Need installed a custom recovery. Your device at least to 50-60% charge for flashing. Download Oreo ROM for Redmi Note 4. *****There is no need to install GAPPS for Pixel_2AOSP_MildoROM.Zip. It is already included. ******Install GAPPS only for Android8.1_RedmiNote4.Zip ROM. 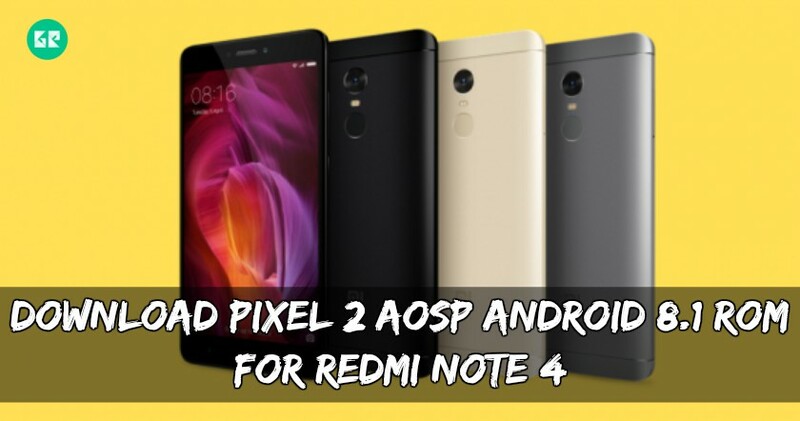 Download ” Pixel_2AOSP_MildoROM.Zip ” Or” Android8.1_RedmiNote4.Zip ” copy the ROM which you want to install. Turn off your phone and enter recovery mode. In recovery go to ‘ Wipe And Format Option ⇒ Wipe Data, Cache And Dalvik Cache ’ via recovery. Now back to recovery menu and go to Install. Then navigate to the ROM you downloaded ZIP file, and swipe for flashing. Then reboot your device and enjoy. Note: The first-time Reboot will take 4-5 minutes to boot, don’t interrupt the process. If you like the post don’t forget to like our Facebook Page.